RV life offers a great advantage in giving you the comfort of home even when you’re on the road. That being said, as free as you may feel while traveling wherever you see fit, you are restricted by the size of your mobile home, particularly in regards to your kitchen. This can be frustrating, but fortunately, many RVers before you have come up with creative ways to make the most out of their small spaces. You don’t need all of your fancy appliances to come with you in your RV. With strategy, you can have everything you need to cook without taking up too much room. Keep it to only the essentials. These will vary between RVer — what you usually make isn’t necessarily going to line up with other people’s priorities. Assess how you cook when you’re not on the road, and what’s the bare minimum of what you need. Regardless of storage space, when it comes to RVing, you have to consider the weight everything you bring along with you. The heavier your load, the more fuel you will burn through. A simple way to lighten things up is through using lightweight kitchen accessories. It’s also helpful to pack items that can be used in multiple ways. For example, your Tupperware could double as mixing bowls. Instead of metal, you might consider a lighter weight material, such as plastic or wood. Add lightweight shelves to your cabinets so increase your storage. Add magnets to certain containers to stick on your refrigerator, or add magnet strips underneath your cabinets to affix these items to. Store dry goods in stackable containers. Install storage racks underneath your cabinets. Install hanging storage units inside closet doors and cupboards. Don’t bring food that you don’t really need. Reduce the amount of food you purchase, and keep it light throughout your journey. Invest in a mountable spice rack. Use collapsible containers whenever you can. 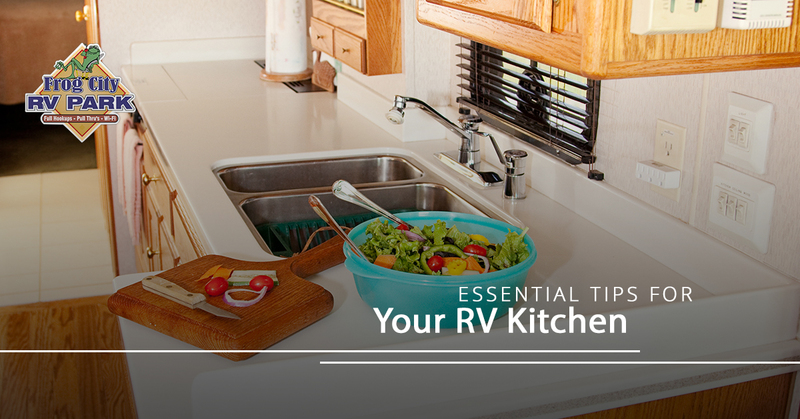 A key factor to consider in your RV kitchen is the fact that it’s moving. With every bump, shift, or shake, loose items can go flying. Before you hit the road, make sure everything is secure. Use non-slip pads in your cupboards, as these will help your glasses and dishes stay in place. Speaking of your cupboards, you will want to make sure the cabinet doors do not fly open by securing them with latches (that goes for your drawers too). A microwave convection oven is essentially what would result if a microwave and an oven had a baby. It’s small enough to mount underneath your cabinets, like a microwave, but you can use it to reheat food AND to cook food in the way you traditionally use an oven. There are certain unique food safety tips to take under consideration when it comes to your RV. You should familiarize yourself with everything to do with your water system and refrigerator in order to avoid food poisoning. First of all, understand that your fridge should be between 35 and 40 degrees Fahrenheit before you add (already chilled) foods to it. Keep your fridge between this temperature for as long as you use it. If you’re passing through Louisiana in your RV, we would love to say hello. Come visit our RV park in Lafayette for some Cajun hospitality, and you’ll understand why we have so many visitors that come back again and again to see us! Reserve your spot online today.